The Pega Customer Relationship Management suite includes a PegaCRMMarketingSample.zip file that contains the sample artifacts for the integration with Pega Marketing and Pega Customer Decision Hub. The sample artifacts assume an architecture where Pega Marketing and the calling applications (Pega Sales Automation, Pega Customer Service, or both) are installed on the same Pega Platform instance and database server. You can use this architecture for evaluation and demo purposes. For information about how to implement the Pega Customer Relationship Management suite of applications, see Configuring your application for Pega Customer Relationship Management in the implementation guide for each application in the suite. 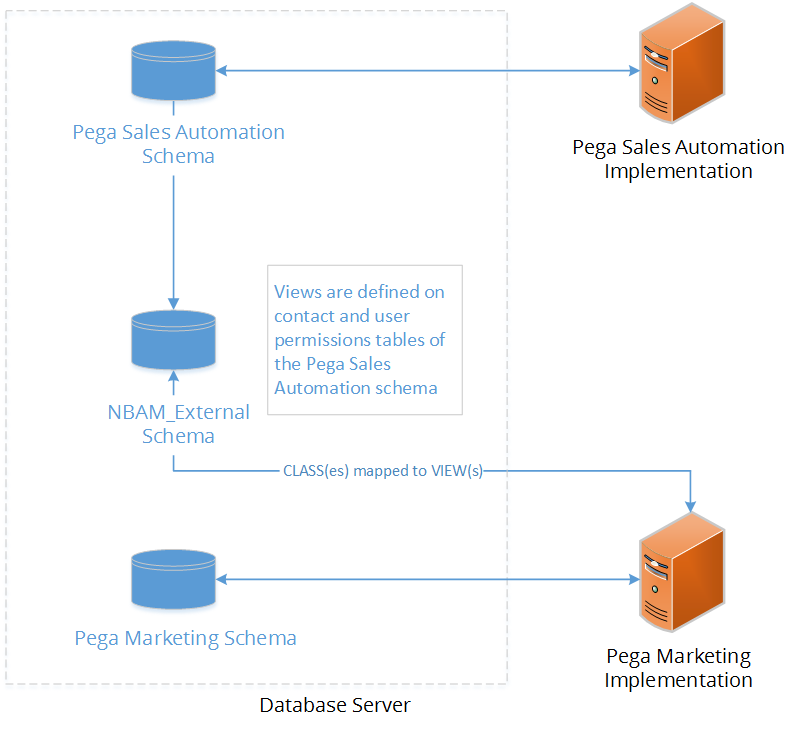 To allow Pega Marketing to access the contacts in Pega Sales Automation or Pega Customer Service, a database view is built on the crm_entity_contact and pa_contact tables in the NBAM_External schema. The database view is mapped to the Customer class in the Pega Marketing application. Flows in Pega Marketing use the attributes from the Customer class to locate the targeted segment of customers. The following figure shows how Pega Customer Relationship Management integrates with Pega Marketing and Pega Customer Decision Hub. You can configure Pega Sales Automation, Pega Customer Service, and Pega Marketing on different Pega Platform instances or versions. However, these instructions assume that all applications are installed on a single Pega Platform instance and version, that the applications are maintained separately, and that the integrations between them are handled through Federated Case Management or REST services.